Emily grew up in central Maryland and relocated to North Carolina in 2018. She received her bachelors degree in biology from Bates college and in the ensuing eight years she worked with wildlife, handling everything from elephants to the quail of Fort Bragg. 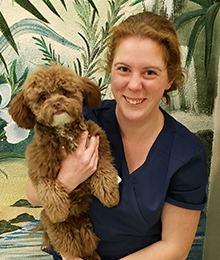 Emily is an avid competitor in various dog sports (with the enthusiastic help of her 5-year-old German Shepherd), and spends most of her down time hunting, fishing, and painting. She is very excited to begin her journey at Dogwood!